GPS III Space Vehicle 01 (GPS III SV01) at Lockheed Martin’s GPS III Processing Facility. 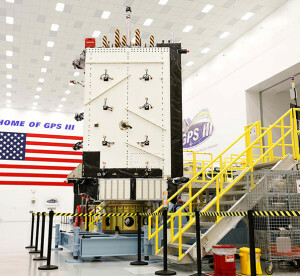 The first advanced GPS III satellite successfully established remote connectivity and communicated with the Next Generation Operational Control System, further validating the U.S. Air Force’s modernized Global Positioning System (GPS) is ready to launch its first satellite. On November 2, 2017, GPS III Space Vehicle 01 (GPS III SV01), the first of 10 GPS III satellites designed by Lockheed Martin, and OCX, being developed by Raytheon Corporation (NYSE: RTN), successfully completed Factory Mission Readiness Testing. The FMRT validated the command and control interaction between GPS III and the OCX’s Launch and Checkout System through a simulated full launch and early orbit mission event sequence. During this end-to-end system demonstration, command signals were sent from the latest OCX LCS software installed at Lockheed Martin’s Launch and Check Out Capability node in Denver to Schriever Air Force Base in Colorado Springs, Colorado. From there, the commands were uplinked back to the GPS III SV01 satellite, currently awaiting a call up for launch at Lockheed Martin. GPS III SV01 and OCX first “talked” to each other during a link check on October 3, 2017. The demo further verifies the space-to-ground compatibility between GPS III satellites and OCX. During a 2013 Compatibility & Integration test, Lockheed Martin’s GPS III Nonflight Satellite Testbed (GNST) – a full-sized, functional satellite prototype – also connected with and received commands from an earlier version of Raytheon’s OCX LCS software. On September 22, 2017, the Air Force declared GPS III SV01 “Available for Launch,” with launch expected in 2018. The successful FMRT was the final validation that GPS III SV01 is ready to be shipped to the launch pad. GPS III will have three times better accuracy and up to eight times improved anti-jamming capabilities. Spacecraft life will extend to 15 years, 25 percent longer than the newest GPS satellites on-orbit today. GPS III’s new L1C civil signal also will make it the first GPS satellite to be interoperable with other international global navigation satellite systems, like Galileo. OCX will revolutionize GPS command and control and mission management capabilities. 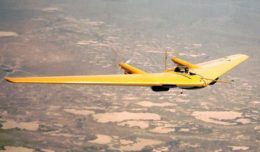 It will control all legacy and new signals, provide protection against evolving cyber threats, and reduce operation and sustainment costs through efficient software architecture, automation and performance-based logistics. OCX represents a quantum leap in capabilities over the current system, providing flexibility and adaptability to meet future GPS mission needs. The GPS III and OCX teams are led by the Global Positioning Systems Directorate at the U.S. Air Force Space and Missile Systems Center. Air Force Space Command’s 2nd Space Operations Squadron, based at Schriever Air Force Base, Colo., manages and operates the GPS constellation for both civil and military users.